With this authentic HOBBY GRADE 1:12 scale off road truck, you’ll be ready to ride with the big boys! Best of all, this monster of a truck comes ready to go right out of the box! Insane and extremely fast, the XGX 5 has been radar tested at 22 MPH. With 4 wheel drive power-train for traction and stability, a high performance 390 heat sink engine, and large coil cover shocks for taking on tough terrain, this beast can handle on and off road! A professional front steering system features quick turning response, and you can even race 4 at a time! This XGX 5 is the ultimate performer and packed with the ability to handle hard to maneuver areas. If you’re ready for some heart-racing action, this off road truck is ready for you. Operate up to 4 trucks at one time! Off road racing just became a lot more fun with the 1:12 scale XGX 4. 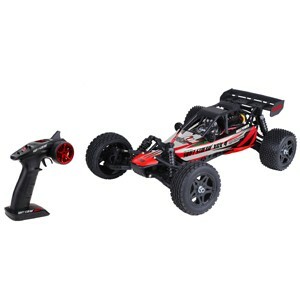 This ready to use HOBBY GRADE buggy packs insane speed—radar gun tested at 22 MPH! The 2.4 GHz controller allows you to drive in any direction with astonishing precision. Powerful 4 wheel drive, a heat sink engine, large coil cover shocks, and a high torque steering mechanism, makes it easier than ever to execute rugged rides and climb tough terrain like a boss! Operate up to 4 buggies at one time!